Introduction of an all-new hatchback companion to the sedan. 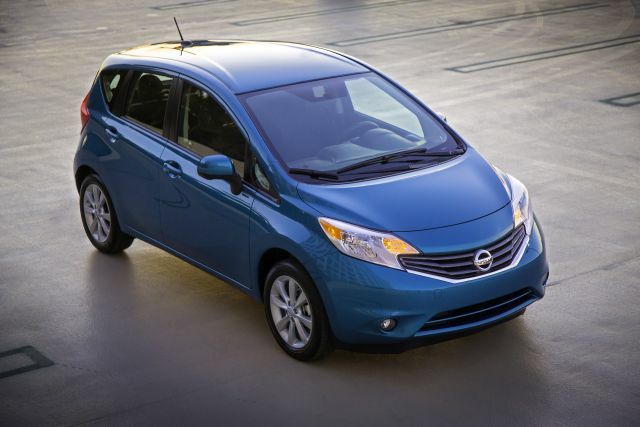 Versa is this Japanese automaker’s entry-level car and both body styles have four side doors. The hatch returns after a one-model-year hiatus. 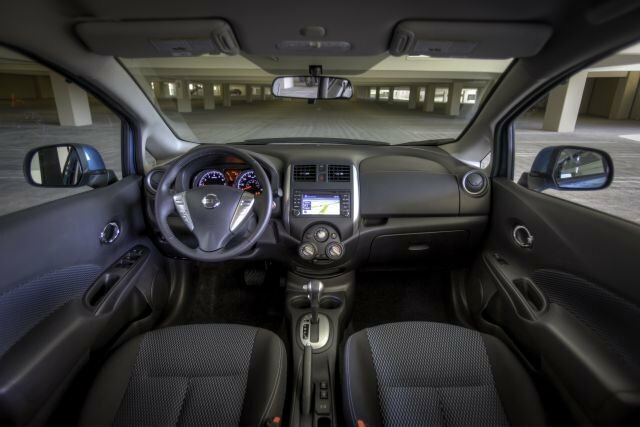 It’s slightly more expensive and is now called the Versa Note, the name it wears in overseas markets. The sedan received a clean-sheet redesign for 2012 and for ’13, remains the lowest-priced new car in America. Mechanical specifications are similar, though the Note is available with some items you won’t find on the sedan, including Nissan’s clever Around View Monitor surround-camera system. Should I wait for the 2015 model? Two different automobiles require two different answers. If you want the hatchback, there’s little reason to wait. Since it’s new for 2014, Nissan won’t make fundamental changed for ’15, though do anticipate addition of a sporty SR version and a new top-line SL model. The 2015 sedan is a different story. Expect it to receive a freshening to bring its exterior and interior styling in line with those of the brand’s other sedans, such as the compact Sentra and midsize Altima. Updated infotainment and convenience features will likely be part of the mix as well. We’re huge fans of the hatchback. It reflects a certain Euro chic, probably because it’s among the first Nissans developed in conjunction with Renault of France, the Japanese automaker’s corporate partner. It’s voluminous inside, has great ride quality, and doesn’t cost much. So if you’re not disposed to either of the two gussied-up ’15 additions mentioned above, a ’14 Note is a great buy. Similarly, the sedan’s updated appearance will give its looks a longer shelf life than its 2014 counterpart. But with no substantive changes to dimensions or powertrain, a ’14 Versa sedan is a good subcompact value, particularly with dealers anxious to clear inventory before the revamped versions come out. None, although the previous-generation hatchback did offer a 122-horsepower four-cylinder engine. Now, all Versas use the same 109-horse 1.6-liter four-cylinder. S versions come with a five-speed manual transmission and S sedans are avaiable with a four-speed automatic. All other Versas have the Xtronic continuously variable transmission (CVT). A CVT operates like a conventional automatic but delivers power like a rheostat rather than via stepped gear changes. These are not quick cars. They have friendly, predictable handling. But modest power and the characteristics of a CVT drain away much sense of lively acceleration or throttle response, replacing it with intrusive droning if you want to get away briskly from a stop or attempt anything more than routine highway-speed passing or merging. Although Renault is a proponent of electric vehicles, there are no plans for a battery-powered Versa, Nissan instead fielding the Leaf in that role. Similarly, don’t imagine arrival of a hybrid anytime soon. Gas mileage is already quite good, and the added expensive of hybrid runs counter to this vehicle’s budget-based pricing. Yes. 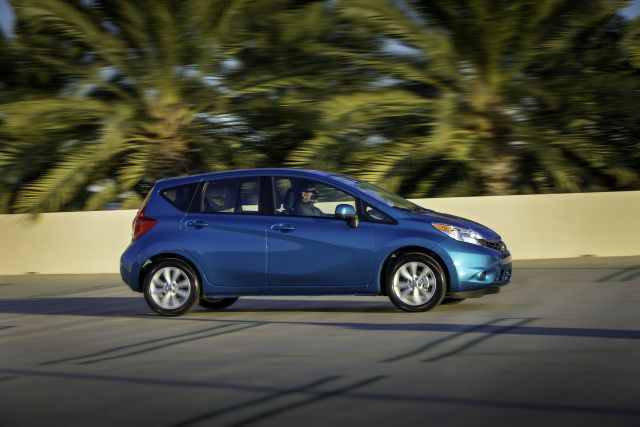 The previous generation hatchback earned EPA ratings as high as 28/34/30 mpg city/highway/combined with the CVT. Today’s sedan and Note do better, sharing a rating of 31/40/35 mpg with that gearless transmission. They rate 27/36/30 mpg with the manual transmission. And sedans with the conventional four-speed automatic transmission are at 26/35/30 mpg. Yes, primarily by virtue of the Note’s arrival, which brings with it the Around View Monitor. Part of the SV version’s Tech Package (around $800), it utilizes a quartet of video cameras on the car’s exterior to project a 360-degree image on the 5.8-inch color dashboard screen. It’s cool and useful, too, in garages, city parking, and other close-quarters situations. Air conditioning and a CD player with auxiliary stereo input jack are standard on the S, which is one of the few new automobile with manual locks and hand-crank windows. S Plus versions gain cruise control and the CVT. The SV nets you power windows and locks, and Bluetooth connectivity on the hatchback. The latter feature is optional on the SV sedan and standard on the SL sedan. Moving to the SL sedan means satellite radio and keyless entry with pushbutton engine start. The SL Package for the Note adds these features along with a rearview camera and heated front seats. A Technology Package is optional on the SL sedan and SV Note. On both cars, the package adds a navigation system, support for streaming audio over Bluetooth, and hands free text messaging. How will prices be different? They’ll inch upward for the sedan, but at $12,800, the ’14 S with manual transmission will remain the least expensive new automobile in on the U.S. market. (Base prices here include the manufacturer’s mandated destination fee, which is $810.) The top-line SL sedan begins at a friendly $17,700, and even with its $760 navigation-equipped Tech Package and $700 to upgrade to alloy wheels, it’s still $19,160. The ’14 Note S starts at $14,800 with the manual transmission, with the CVT-outfitted S Plus at $16,050 and the SV well worth the walk to its $16,800 starting price. Load up a Note SV with the Tech and SL packages (the latter adding pushbutton start, USB/iPod control, and Nissan’s nifty Easy Fill Tire Alert, and 16-inch alloys) and you’re right at twenty-grand. Note arrived at dealers in mid-calendar 2013. The sedan followed shortly. Easy-Fill Tire Alert should be included on every Versa. It’s standard the Note – but unavailable on the sedan. Both have a low-tire-pressure dashboard warning, but the innovative Easy-Fill component goes a step further once you stop to inflate a low tire. As air begins flowing, the vehicle’s flashers come on to confirm the process has begun. The horn chirps when proper inflation is reached, no tire gauge required. Low inflation triples risk of an accident, and proper pressure can boost gas mileage by up to 3.3 percent, according to the U.S. Department of Energy. Nissan is phasing-in the system across its lineup and says it’ll eventually be standard on every vehicle it sells. But we think the Versa sedan, which targets inexperienced new-car owners, would benefit from a system that promotes such an important but often-overlooked facet of vehicle maintenance.